A United Kingdom, Amma Asante’s chronicle of events that eventually led to the birth of The Republic of Botswana, serves three purposes: to provide a historical primer (somewhat fictionalized to make for more compelling cinema) of events in the African nation during the immediate post-World War 2 era, to tell an interracial love story, and to remind viewers that worldwide progress in racial equality hasn’t come as far as many might like to believe. Like many fact-based movies that touch on the subjects of race and race relations, A United Kingdom aims to shock modern audiences by relating the ugly truths about how things were. The movie is light on overt social commentary but echoes of things that transpire in the film can be seen in modern real-life circumstances. The movie also makes the telling point that some inequitable policies are politically driven. The anti-miscegenation attitudes displayed by the British government in this case were as much the result of a fear of alienating South Africa (which was instituting apartheid at the time) as they were of an inbred British disinclination to approve of mixed-race couples. Although A United Kingdom has a social agenda, it is first and foremost a love story. Like Loving, it’s about how the affection between a man and a woman of different races affects not only their immediate social circles but has ripples that wash over the entire world and impact history. A United Kingdom never sacrifices its narrative in favor of making a statement and it rarely resorts to sermonizing. To the extent that the film demonizes representatives of the British government, that’s entire reasonable considering the story that’s being told and the perspective from which it is being related. Seretse Khama (David Oyelowo), the Prince of Bechuanaland, is in London attending school when, in 1947, he meets Ruth Wilson (Rosamund Pike). Their whirlwind romance, which begins as a lark, turns into an international issue when he asks her to marry him and she accepts. They face resistance from all quarters. Ruth’s father disowns her. Seretse’s uncle, Tshekedi Khama (Vusi Kunene), the current regent, refuses to accept a white woman as his queen. British government representative Alistair Canning (Jack Davenport) warns that unless the engagement is dissolved, there will be hell to pay on the African continent, especially where South Africa is concerned. Despite misgivings, Seretse and Ruth forge ahead, marrying in England then traveling to his home, where he must stand before a tribal council and make his case. The council backs him and affirms his kingship but this causes a break between Seretse and Tahekedi and gives the British government an excuse to act. Putting aside the weightier issues, A United Kingdom is structured as an “underdog overcoming” story. Determined not to bow to the pressure that seeks to nullify his love for Ruth, Seretse risks losing everything including his right to return to his country. He fights not only local powers but those at the pinnacle of the British power structure (including Prime Minister Winston Churchill, who reneges on a promise made to Seretse). When he triumphs at the end, which history determines he must, it’s a moment ripe for applause. 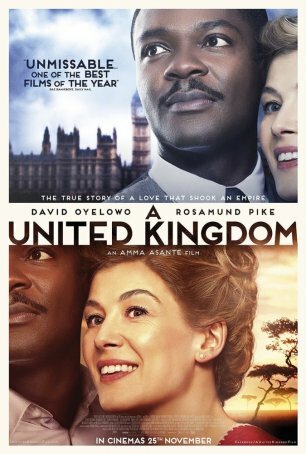 One key to A United Kingdom’s success is that both leads, David Oyelowo (who played Martin Luther King Jr. in Selma) and Rosamund Pike, portray their characters as human beings rather than the international icons they have become. We relate to their story on a basic human level - lovers fighting against corrupt and duplicitous forces that seek to pry them apart - and the actors’ efforts aid in our ability to accept this. A United Kingdom is meaningful and touching - a historically based movie that teaches lessons for today as well as educating us about the birth of a nation.